First, a confession: I am not a runner. In fact, I can't say I enjoy running all that much -- I'm slow, impatient, and easy to give up. Over the years, I've picked up and put down running the way one does a long classic novel that you know you should read but can never quite finish (do you hear that, War and Peace? It's not just you). But I also can't deny that running is an effective form of exercise -- and cheap -- which is why I find myself returning to it in times of need. In March, I realized that a long winter of little exercise and too many potatoes had made me cranky and out-of-shape in a way I disliked. With a gym membership more than cost prohibitive in style-conscious, overpriced Astana, it was time to pick up my old friend running again. Like many of my experiences here, running in Kazakhstan became more than just about lacing up a pair of shoes and hitting the pavement: it was yet another way both to see this city through a new lens and test the boundaries of cultural norms. Because it's hard to wax prosaic about running without sounding like one of those weirdos who enjoys minimalist shoes (shoes with toes are weird! ), I've decided to write the rest of this blog post in the form of a "cheers and jeers" list. 1. Cheers to the incomparable view. 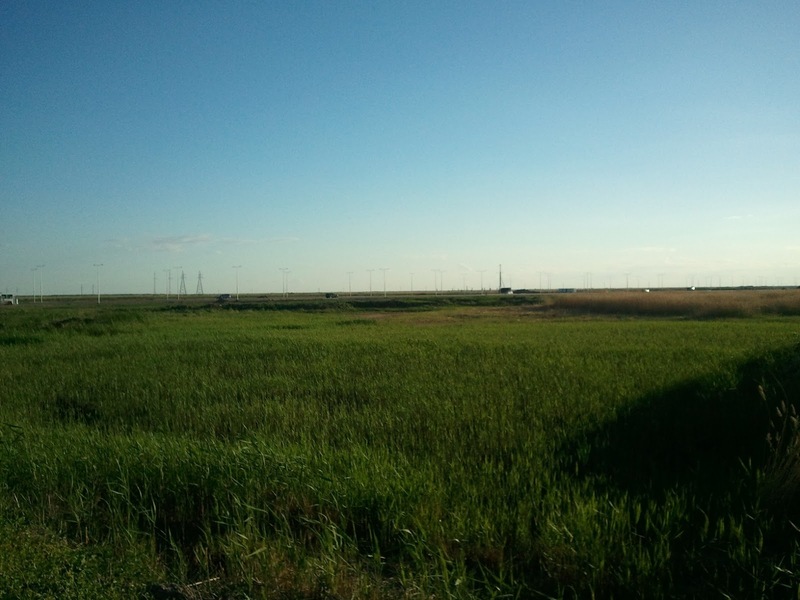 Whether you're in the city -- surrounded by futuristic looking buildings -- or out on the outskirts swallowed up by the expansive steppe/marshlands, the surroundings are never boring. One of the many cityscapes you can see running along the river embankment. 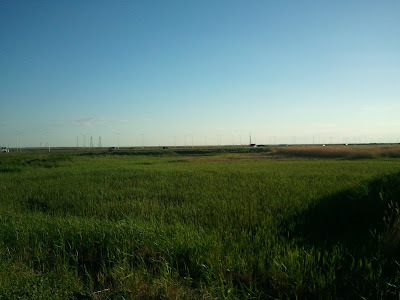 Running into the outskirts, the glossy skyscrapers fade into the open steppe/marshland. 2. Jeers to stares, wolf whistles and the occasional attempt to run me over with a car. Running in the city requires a steely resolve to avoid engaging passersby who find it both hilarious -- and perhaps implausible -- to see anyone, let alone a woman, running through the streets in shorts. As someone who sticks out as a foreigner, the stares I'm used to, but the wolf whistles from construction workers and unwanted commentary from groups of aimless young men is beyond annoying. On the plus side, the anger I feel generally motivates me to run faster and further. 3. Cheers to running with others. I finally figured out that running with other people is better than running solo. I get bored easily -- not to mention impatient -- but scheduling runs with colleagues and friends has motivated me on days I would much rather just sit at home and watch Netflix. (Now I run, then go home and watch Netflix). 4. Jeers to running after greasy Chinese food. On one particular run, poorly scheduled after a deliciously heavy meal of Chinese food, I spent half the time regurgitating spicy tofu onto the side of the steppe. Still, I rallied through it, and now can proudly -- or perhaps not-so-proudly -- claim that I've made my "mark" on Kazakhstan. However, I don't recommend the experience. 5. Jeers to uneven pavement and trails to nowhere. Sidewalks in Astana are either composed of bricks or stone, both of which warp in the heat and crack in the extreme cold. This makes for a hard, uneven surface that is a killer on the joints, not to mention a hazard while running. Trails along the river are nice, but occasionally end abruptly or lead to nowhere. Dry paths on the steppe, which are my favorite surface, often get washed out in the rain or overgrown by grass. In short, this is not a running-friendly city! 6. Cheers to not being a total schlub. I can't say I've become a faster runner, but I feel slightly better about my overall exercise to food ratio. 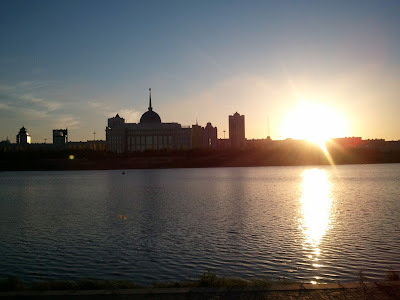 No doubt I will be happy to return to a place where runners are a norm, rather than an oddity, and where urban environments are designed with runners in mind, but what I've liked about running in Astana -- despite all the frustrations and unwanted attention -- has been the opportunity to see this city from a new perspective. Next up: I'm on vacation starting Saturday, when I head to Europe for two weeks, but rest assured there will be more blog posts in the near future.